The Prem Mandir is a very beautiful and recently built temple, the stories in sculptures all around of Lord Krishna and Radha Rani. The Prem Mandir is not only so beautiful but the values of depicted and maintaining the essence of Love propagated by Lord Krishna too amazing. The Prem Mandir located on Raman Reti Road Vrindavan it's about 5 kilometers from Mathura. 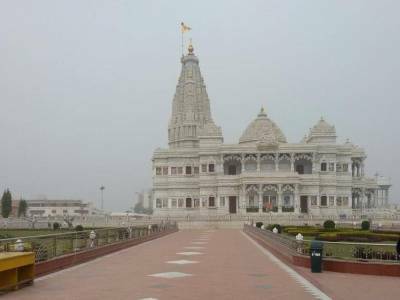 The Prem Mandir temple campus is huge and spread across in acres of land with eye catching and splendid depiction of Life events from the life of Lord Krishna. Statues and large scale monuments coupled with lush green garden and flowers, keep Visitors in awesome company. The Janmashtami‎ and ‎Radhastami is the Major festival celebrated in the temple. 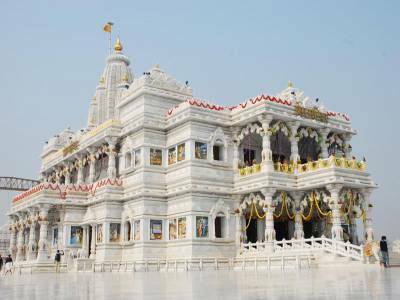 Prem Mandir temple take about 12 years to build and inaugurated in 2012 by Shri Kripalu Ji Maharaj. Idols in the main temple are adorable and thats a sight and treat to eyes. It is recommended that Visitors visit during night to see the lovely campus and fountain show. Prem Mandir Temple gates was closed at 8:30 PM, so please plan accordingly, if you planing to visit during night. A must visit place, if you are in the Vrindavan! Must go and indulge in Spiritual love. 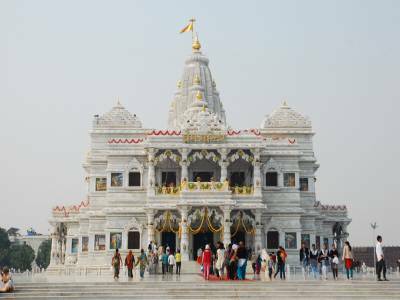 Get quick answers from travelers who visit to Prem Mandir.